As I work on my own piece about the late Karl Edward Wagner and his character, Kane, what comes along in Black Gate but an article about "Dark Crusade". It's not simply a review but an examination of the why swords and sorcery has been shunted to the sidelines by the doorstopping series that have come to dominate the fantasy market. I think the author, Brian Murphy, keys in on several good reasons for S & S's displacement in the marketplace. The commenters bring up several good additional points. The Kane novels are good and "Dark Crusade" is the best. However, for the best of Kane get the short stories. They're all together in "Midnight Sun" from Night Shade Books. If that's expensive for you you can get the best in "Death Angel's Shadow" and "Night Winds" for a lot less. 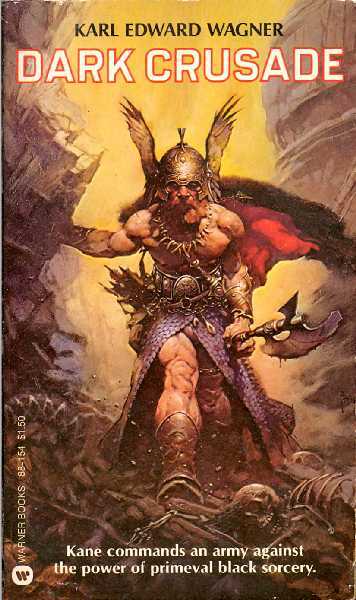 And with classic, if not quite accurate, Frazetta covers. I believe too that the best of Kane lies in the short stories. But then what an awesome battle-description is that in the Blooding chapter... Epic Epi Epic!!!!!! Actually both Dark Crusade and Bloodstone have such great battles. Do you know where Wagner's essays or articles about Kane can be found? I'm really interested in Wagner's own view on Kane...and the Wagner site is not enough!!!!! There's an essay about Kane's evolution in the back of "Midnight Sun: The Complete Stories of Kane " by Wagner. The KEW website I link to on the right of the page is only (and a good one fortunately) site dedicated to the man and his work. Also, not Kane connected, but his introductions to the Year's Best Horror he edited for 15 volumes are pretty good snapshots of that genre. He clearly dug deep and hard to find the best stories for his collections and it helped make him one of the most authoritative voices in the field. Christmas Present - woo hoo! Voidals and Spydrons and Ratlings, oh, my!